Kinematic scheme's muscle is a skeletal muscle, each muscle may regard as an organ. Divides into a muscle, the torso muscle, the four limbs muscle and so on. Outside divides into the flexor, the extensor, in the adductor, the abductor, to turn on lathe myo-, turns on lathe the muscle and so on. Divides into long myo-, short myo-, flat myo- and the round circle muscle and so on. 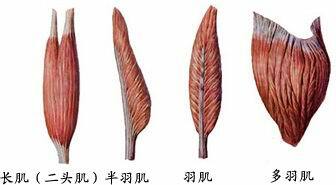 Each muscle constitutes by the venter musculi and tendon two. The venter musculi constitutes by the muscle fiber, has the contraction function. The tendon contracts the organization by the compact knot to constitute, the platysma tendon calls the aponeurosis. Also divides the shallow fascia and the deep fascia. 1) shallow fascia: Located at hypodermic, contracts the organization by the loose knot to constitute, also calls the hypodermic fascia. 2) deep fascia: Located at the shallow fascia deep surface, contracts the organization by the compact knot to constitute. Located at the tendon and the bone surface contact place, are one airtight, the knot contract the organization flat pouch, the content synovial fluid. 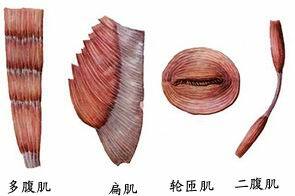 Bao Yuchang outside the tendon, is a mutually continual double-decked sheath shape structure, the content synovial fluid. A muscle divides into the surface muscle and the musculi masticatorii. 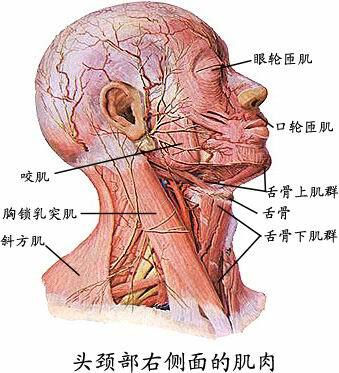 Also calls the expression muscle, mainly has the pillow musculus frontalis, the eye wheel circle muscle and the mouth wheel circle muscle and so on. Provides around nie the lower jaw joint, mainly has the musculus masseter, nie the muscle and so on.